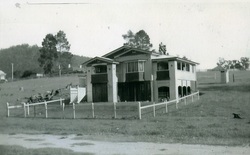 71 Royal Parade 1937. Note Granite house in background. From Jeff Pratt, 71 Royal Parade, St. John’s Wood. I was born in Stafford, Brisbane in 1955. How did your family come to live in St. John’s Wood? As an adult, our family moved to St. John’s Wood to upgrade to a larger house. A love of old homes helped us chose the area. Our home is a three gabled Ashgrovian. Thanks to the SJW history group I have some lovely old photos of the home, when the owners were the Reid family. We decided to live here as it is an excellent area, close to the city, as well as good schools and shopping nearby. We did most of our shopping at Ashgrove Woolworths and used the butcher and convenience shop across the bridge at Chandler’s Corner. We always went to the Ashgrove shops in the car. Were there other members of your family living in the area? The mother of my children had an Aunty, Jean Winters that lived in Buckingham Street in the Woods. What were your earliest memories of St. John’s Wood? Moving from the house I was born in to come to the Woods. The parks and creek were a big attraction. We moved here in 1984. I remember the squash courts, where the day care centre is now, and the old play equipment in the park. Who made up your family that lived in the Woods? Mother, father and three children. Our youngest one being born after we arrived here. Where did you go in the local area for family entertainment and recreation? We took the children to the parks mostly. We went to the Australian footy field near the bowls club and to the parks near Fraser Road. What type of games did your children play growing up? Our eldest, Daniel played soccer for The Gap. Lauren played netball for The Gap and Chris played rugby league for West Juniors. Did you have chores to do when you were growing up? Did you get pocket money and what did you spend it on? Yes, making beds up and sweeping the floors. We did not get any pocket money. We did get money for our birthdays that we used to spend when we went to the exhibition. What was your favourite thing to do for fun? Riding down to the old wood BBQ’s with the children and cooking sausages. Did you use the public transport system? Or did you have a vehicle to get about in? We used the bus to go to the city and the children caught the bus to high school. We also had a car. Do you have favourite memories of living in St. John’s Wood? I think bringing our three children up in a lovely area. Can you describe the natural environment and how if differs from today? Were there any challenges or difficulties involved in living in the Woods or so near to the creek? The children were told there were crocodiles in the creek and not to go near it until an adult checked it first.